Capital-Output Ratio. A lower capital-output ratio means investment is more efficient and the growth rate will be higher. Level of savings (s) = Average propensity to save (APS) – which is the ratio of national savings to national income. 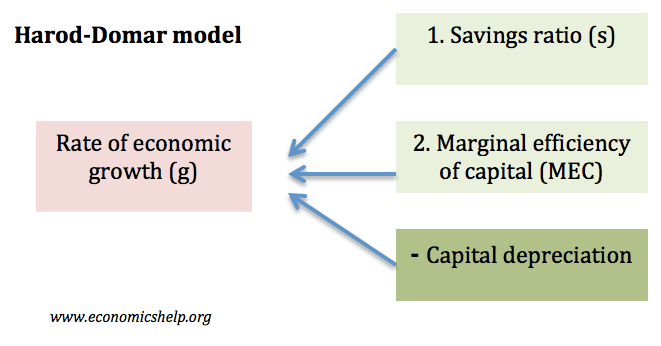 The capital-output ratio = 1/marginal product of capital. The capital-output ratio is the amount of capital needed to increase output. A high capital output ratio means investment is inefficient. Depreciation – old capital wearing out. Roy Harrod introduced a concept known as the warranted growth rate. This is the growth rate at which all saving is absorbed into investment. (e.g. £80bn of saving = £80bn of investment. In this case, the economy’s warranted growth rate is 2.5 percent (ten divided by four). This is the growth rate at which the ratio of capital to output would stay constant at four. The natural growth rate is the rate of economic growth required to maintain full employment. If the labour force grows at 3 percent per year, then to maintain full employment, the economy’s annual growth rate must be 3 percent. This assumes no change in labour productivity which is unrealistic. It is argued that in developing countries low rates of economic growth and development are linked to low saving rates. This creates a vicious cycle of low investment, low output and low savings. To boost economic growth rates, it is necessary to increase savings either domestically or from abroad. Higher savings create a virtuous circle of self-sustaining economic growth. The transfer of capital to developing economies should enable higher growth, which in turn will lead to higher savings and growth will become more self-sustaining. Developing countries find it difficult to increase saving. Increasing savings ratios may be inappropriate when you are struggling to get enough food to eat. Harrod based his model on looking at industrialised countries post-depression years. He later came to repudiate his model because he felt it did not provide a model for long-term growth rates. The model ignores factors such as labour productivity, technological innovation and levels of corruption. 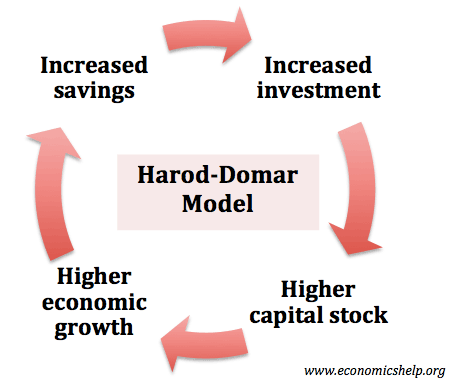 The Harrod Domar is at best an oversimplification of complex factors which go into economic growth. There are examples of countries who have experienced rapid growth rates despite a lack of savings, such as Thailand. It assumes the existences of a reliable finance and transport system. Often the problem for developing countries is a lack of investment in these areas. Increasing capital stock can lead to diminishing returns. Domar was writing during the aftermath of the Great Depression where he could assume there would always be surplus labour willing to use the machines, but, in practice, this is not the case. The Model explains boom and bust cycles through the importance of capital, (see accelerator theory) However, in practice businesses are influenced by many things other than capital such as expectations. Harrod assumed there was no reason for the actual growth to equal natural growth and that an economy had no tendency to full employment. However, this was based on the assumption of wages being fixed. The difficulty of influencing saving levels. In developing economies it can be difficult to increase savings ratios – because of widespread poverty. The effectiveness of foreign capital flows can vary. In the 1970s and 80s many developing economies borrowed from abroad, this led to an inflow of foreign capital however, there was a lack of skilled labour to make effective use of capital. This led to very high capital-output ratios (poor productivity) and growth rates didn’t increase significantly. However, developing economies were left with high debt repayments and when interest rates rose, a large proportion of national savings was diverted to paying debt repayments. Economic development implies much more than just economic growth. For example, who benefits from growth? does higher national income filter through to improved health care and education. It depends on how the capital is used. What happens when Gw is greater than Gn, or vice verca?